Three weddings and – thankfully – no funerals. | there's no place like gnome. Three weddings and – thankfully – no funerals. A summary of the October wedding extravaganza: three weekends, three weddings. First, it was my seminary friend and roommate, jeanette. She married Mr. Dan in the chapel at Luther Seminary. 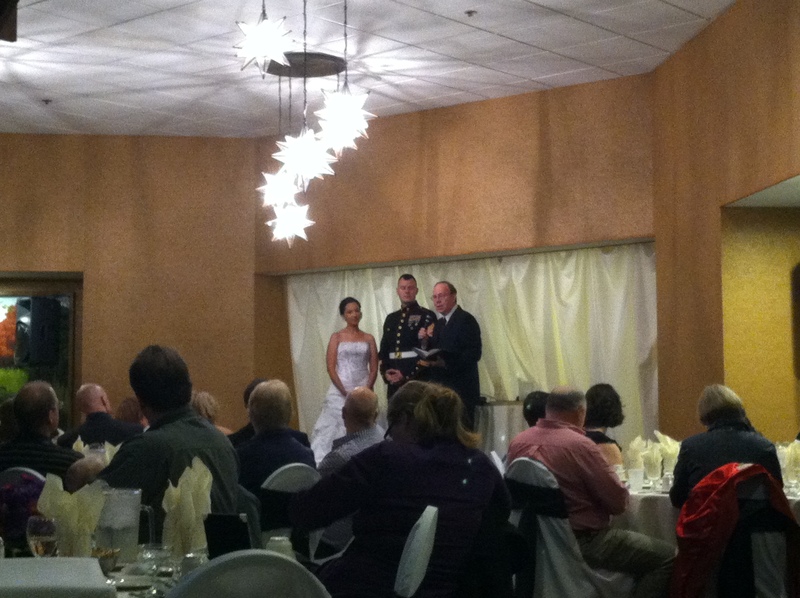 The ceremony was wonderful; intimate and lovely. I met someone that evening; she was actually in the wedding, standing up on Mr. Dan’s side. Former Grace intern Erika and I had much to talk about; gnomes, cardigans, and all. Mr. Dan likes legos and that’s how he proposed to Jeanette. For cute. A reception with fun games! I made cakepops for the occasion! Unlike most brides, Jeanette is getting her money’s worth out of her dress. Weekend #3. Jeanette’s church always serves egg coffee. It was delicious. Egg coffee and I are having some sort of wrestling match for my taste buds. Next was my BFF from my years at Trinity in Stillwater. Sara and I met while working in the CYF department there and we bonded over taking inflatable monkeys to camp. Sara married Mr. Josh, a very tall gentleman who makes me laugh. I officiated the ceremony which was outside at sunset. Romantical. Then, after the cake was served, I had an emotional breakdown. But we won’t talk about that. Last but not least was my college friend, Kara. Kara married Mr. Clint who is kinda of crazy in a fun way and collects clocks. They actually were married at the courthouse many weeks ago but invited family and friends to celebrate with dinner and a reception this past weekend. Receiving a blessing for their marriage. Phew. That’s a whole lot of love. I think one of my favorite parts of my friends getting married is that I feel like I gain a new friend. This month, I gained three. Three stand-up guys who love my friends. They’re all fun people and make my friends happy. That’s lots to celebrate.